Packed with special features including documentaries, interviews, and more! 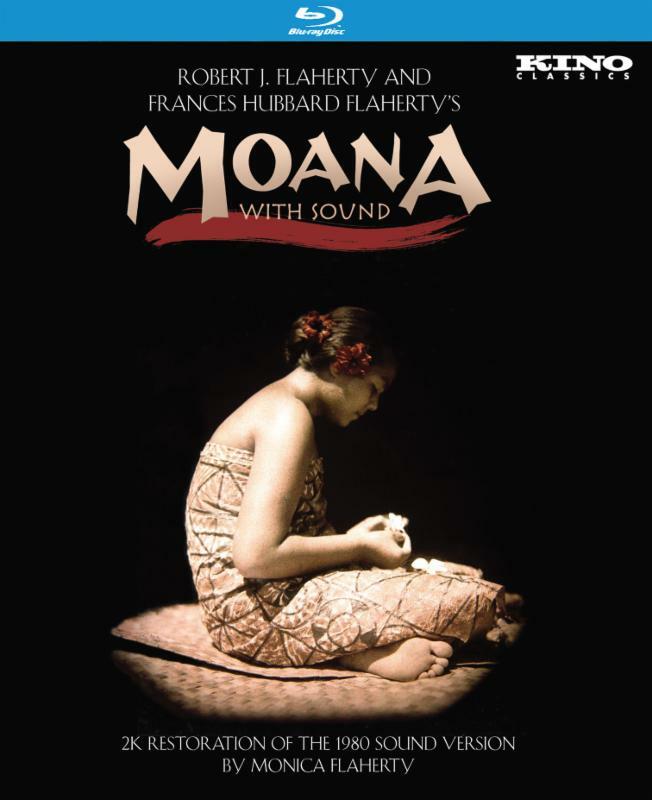 NEW YORK, NY - NOVEMBER 13, 2015 - Kino Lorber proudly announces that MOANA WITH SOUND, Monica Flaherty's 1980 sound version of the groundbreaking 1926 documentary by Robert and Frances Flaherty, begins its theatrical run at New York's Film Forum today in a new digital restoration, to be followed by a Blu-ray and DVD release on December 8. Originally released in 1926, this landmark in documentary filmmaking, depicting the lifestyles of the Samoan people on the South Seas island of Savai'i, was restored by the Flahertys' daughter Monica in 1980. Monica Flaherty traveled back to the island of Savai'i with documentarian Richard Leacock to create a new soundtrack of authentic recordings of the sounds of the island and voices in the regional dialect, taken in the locations where the film had been shot half a century earlier. In 2015, film restorer Bruce Posner and Sami van Ingen (the Flahertys' great-grandson) created a new digital restoration of this important film, combining Monica Flaherty's innovative soundtrack with a pristine 35mm image, so that, for the first time, MOANA WITH SOUND can now be seen -- and heard -- in its full glory. MOANA WITH SOUND will be released on Blu-ray and DVD December 8th packed with informative special features that provide valuable background information on the film and its restoration. These bonus features will include a 39-minute documentary about the film, a short documentary on the restoration, an interview with Frances Flaherty, the Flahertys' home movies, filmed commentaries by historians Enrico Camporesi and Bruce Posner, and Robert Flaherty's experimental 1925 "city symphony" film, Twenty-Four Dollar Island. The SRP for the Blu-ray is $34.95, and the SRP for the DVD is $29.95. After the triumphant success of his true-life Arctic adventure Nanook of the North (1922), director Robert J. Flaherty journeyed with his wife Frances and their children to the South Seas island of Savai'i to capture on film the exotic lifestyles of the Samoan people. It was in a 1926 review of MOANA that the word "documentary" was first used in a cinematic context (John Grierson commented that the film had "documentary value"). While MOANA may not have been a documentary in the purest sense of the word -- the Flahertys "cast" the leading roles and required them to wear traditional clothing, and restaged certain rituals that had, by 1923, already become obsolete-what the filmmakers achieved was even greater. The Flahertys resurrected the recently vanished customs of the Samoan people while they still lingered in the minds of the elders, and dramatized these struggles for survival just before modernization permanently altered the cultural landscape of the island.